Steve used to come here when it was a Chinese restaurant and Leonard Nimoy's autograph was on display, but that was way back in the day. It has been El Borrego De Oro for quite some time now. The central location is convenient but parking is limited so be prepared to park on the street. It's seat yourself here so the boys picked a table in the corner. The chips and salsa arrived in due time. They don't serve sweet tea but Rusty is on a Sprite bender and Steve can't stand sweet tea so no harm done. The chips were pretty decent, not warm but fairly thin. Rusty noticed a lot of broken little chip pieces in the basket, one of his pet peeves. 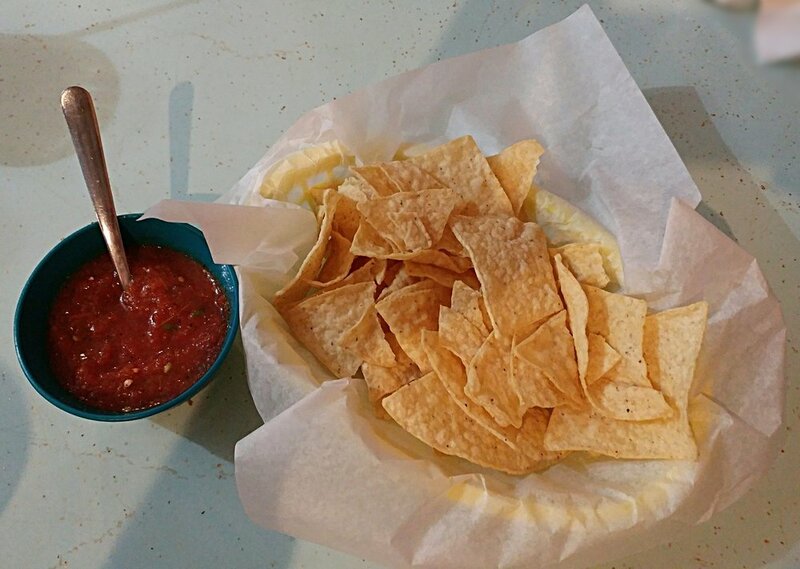 The salsa was standout. It was fresh, spicy, and flavorful with a good texture and a nice burn to it. The service can be a little less than proactive here sometimes. They have a man who refills chips and salsa and tea who is very friendly and a wave is all it takes to get accommodated. The boys both recognize this man from Evita's Botanitas, a long closed South First memory. He got a little distracted banging a pot with a spoon and singing a song for a birthday in the next room, but it was fun. Rusty ordered his favorite - chicken suizas enchiladas. They were delicious with an abundance of creamy sauce and cheesy goodness. 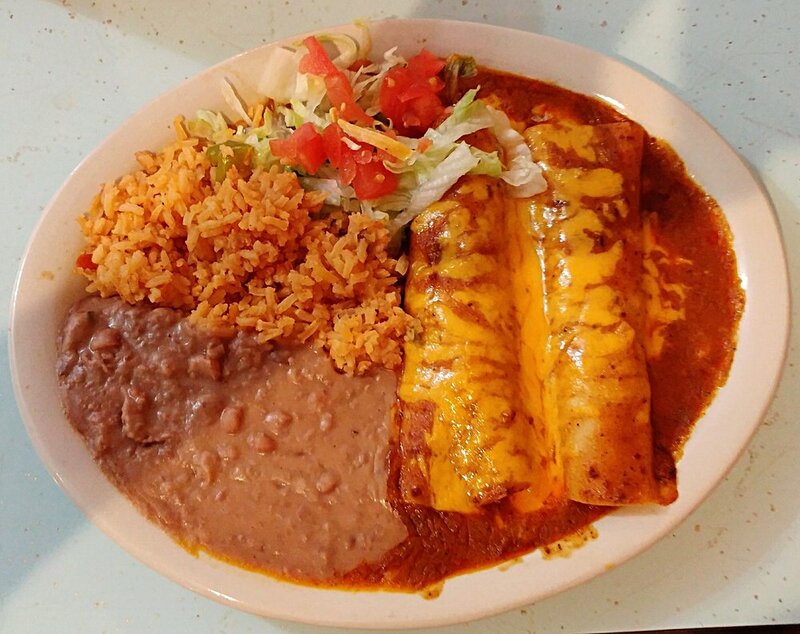 The enchiladas were stuffed with a huge portion of tasty chicken. 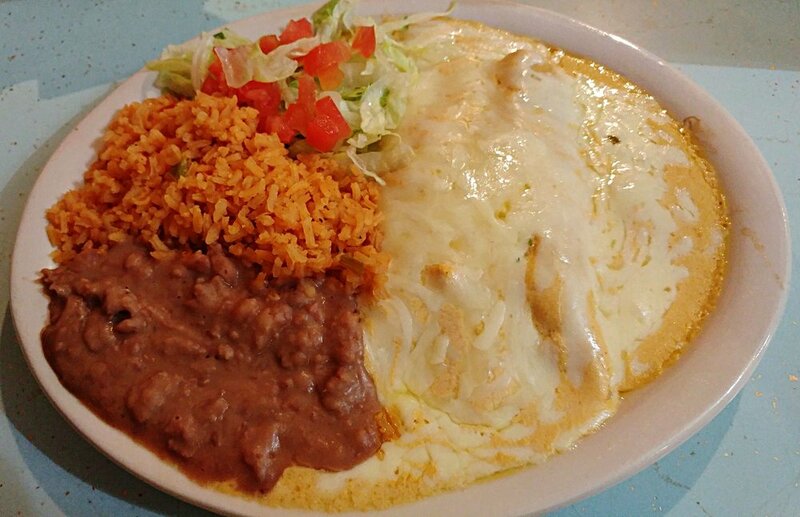 El Borrego De Oro does not skimp on the filling in their enchiladas! Steve went with the beef enchiladas. Like the chicken enchiladas, they too were stuffed fat but with deliciously flavorful ground beef. The chili sauce was a big step above your typical greasy spoon chili con carne. It was a rich and savory chili gravy. There was a good amount of sauce to accompany the huge enchiladas. Cheddar cheese worked its magic and tied everything together like a well loved rug might tie a room together. 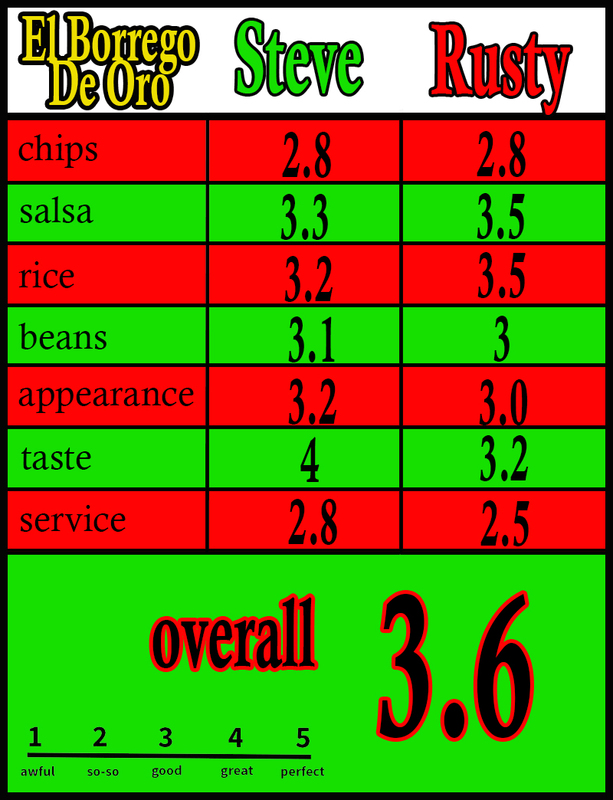 The rice and beans at El Borrego De Oro may very well have saved those categories from the chopping block. After a spate of bland beans and unremarkable rice the streak ended here. The rice especially. It was flavorful and cooked well. The beans were a nice consistency and had a bit of smokiness.